BOSTON, MA -- The regular season is coming to a close as we get set for the start of the Eastern Hockey League Premier (EHLP) playoffs. The final month of the regular season included tons of great action across the league, as well as numerous candidates for the last set of TSR Hockey Stars of the Month. 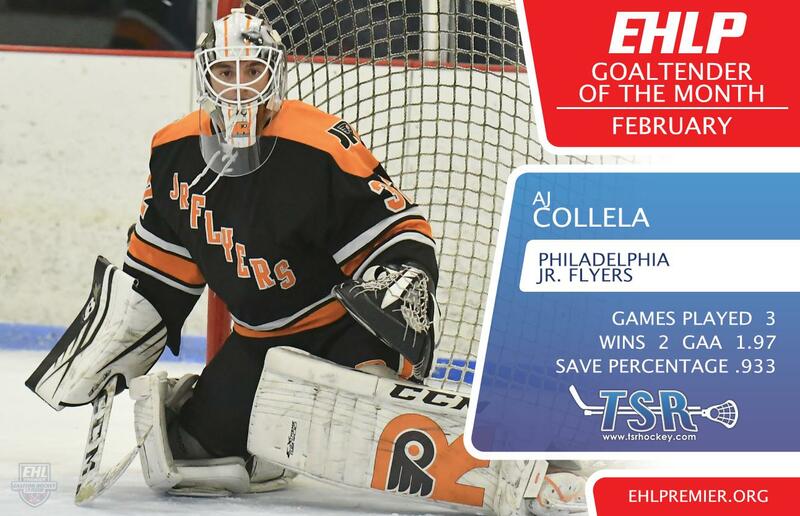 The EHLP is pleased to announce that Kyle Welch (Boston Jr. Rangers), Tom Skold (Vermont Lumberjacks), and AJ Collela (Philadelphia Jr. Flyers) have been named the TSR Hockey Stars of the Month for February. The Stars of the Month will all receive a $20 TSR Hockey gift certificate. Scroll down to read about each player’s performance, and remember to catch the EHLP action all year long on HockeyTV. 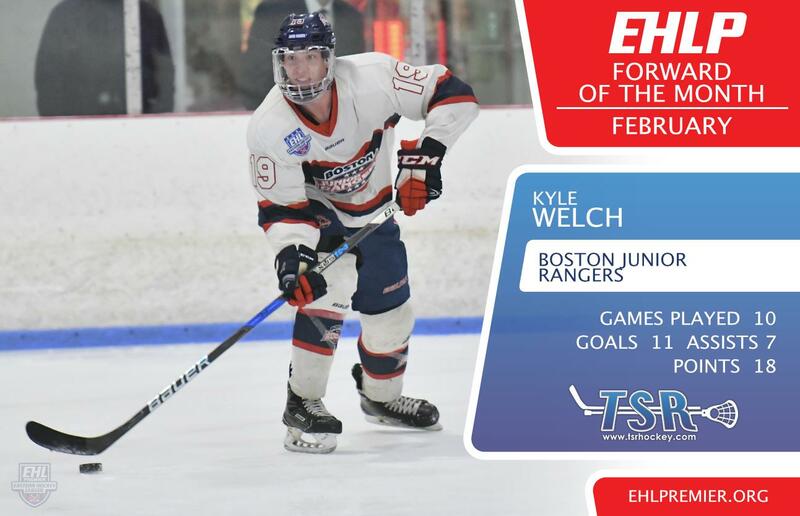 The Rangers have recently clinched the EHLP regular season championship at the end of February, in part thanks to Welch’s performance this past month. The '99 forward had 11 goals and 7 assists (18 points) in 10 games last month for the Rangers, who went 9-1-0 in that span. In just 24 games for the Rangers' EHLP squad this season, the native of Swampscott, MA, has a total of 23 goals and 40 points to his name. Welch also has notched a league-leading nine game-winning goals, to go along with a 1.67 points per game average. The Rangers will finish off their regular season this upcoming weekend with a pair of home games against the Walpole Express, and they will enter the playoffs as a #1 seed in the North Conference. Skold finished February with 12 points, which led the entire EHLP in defensive scoring for the month. The '99 now has 20 points in just 18 games for the Lumberjacks, which comes out to a 1.11 point per game average. The native of Sweden was dominant in his team’s 11-2 win against the Walpole Express on February 14th, posting an eight-point game. The Lumberjacks will cap off their regular season this upcoming weekend with a pair of games at home against the Jersey Wildcats, then they'll await their First Round playoff matchup with the Express. The Jr. Flyers went 7-1-1 in the month of February as Collela was between the pipes for two of the victories. After losing his first game of the month to the New Jersey 87s in overtime, the '99 netminder rebounded nicely with wins over the Philadelphia Little Flyers and 87s. After the solid month, the New Jersey native, improved his overall record up to 13-4-1 and lowered his season GAA down to 2.92. Looking ahead, the Jr. Flyers already clinched the #1 seed in the South Conference and they'll wrap-up their regular season with a pair of games on the road this upcoming weekend against the Philadelphia Revolution.